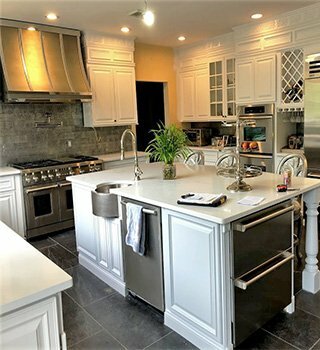 Long Island Wood Renewal, LLC is a trusted, locally-owned and -operated kitchen remodeling company with a track record of delivering high-quality work and personalized customer care. 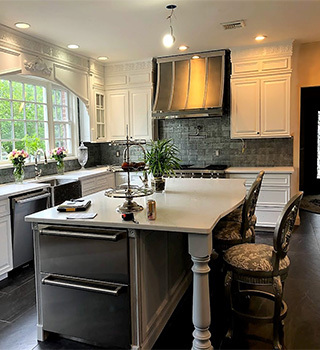 Our high standards and commitment to excellence have made us one of the top-rated companies on HomeAdvisor and earned us the Best of HomeAdvisor award for kitchen remodeling contractors. Honest Work – At Long Island Wood Renewal, LLC, we value honesty and integrity. 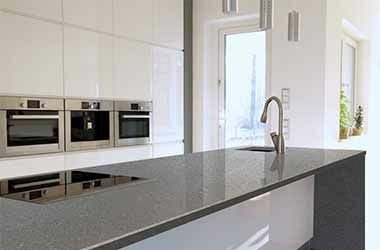 All of our products are built with durability in mind and will last for years to come. We only offer odor- and toxin-free products to ensure a healthy and safe environment for you and the ones you love. Attentive Service – We believe in giving our customers the best service possible. 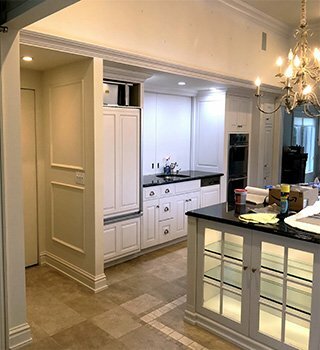 From the initial design to the completion of your project, our team will guide you through every step of the construction process. Our professionals will always arrive on time, work efficiently and deliver high-quality results you’ll love. Customer Satisfaction – We measure the success of our company by the number of satisfied clients we serve. Your input and happiness with our work is our top priority. 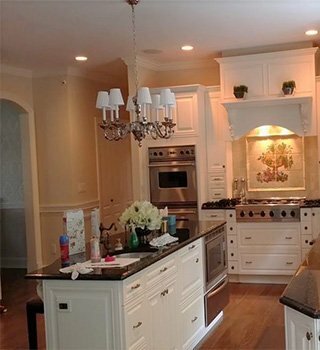 We take pride in our work because it’s on display every day in our clients’ homes. 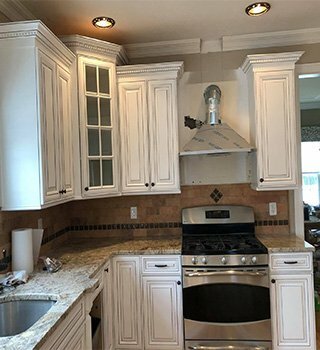 When you need a kitchen remodeling company that provides personalized service and specialty cabinet renewal options, you can count on Long Island Wood Renewal, LLC. 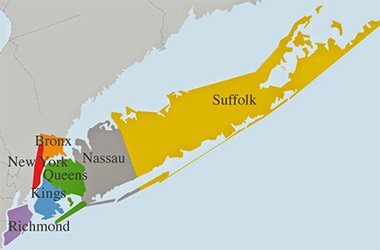 We provide a wide range of products and services to clients throughout Nassau, Suffolk and Eastern Queens counties. To schedule an in-home consultation or to ask any questions regarding our work, call (631) 414-7082. You can also fill out our online contact form to request more information. 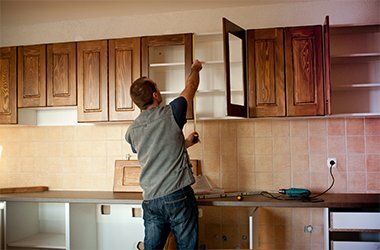 Long Island Wood Renewal, LLC offers complete kitchen remodeling services, from cabinet renewal to new countertop and cabinet installation. 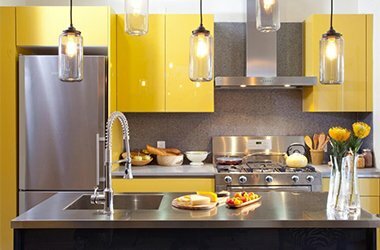 We have been recognized as a top kitchen remodeling company by Angie’s List and HomeAdvisor. We are locally-owned and -operated. 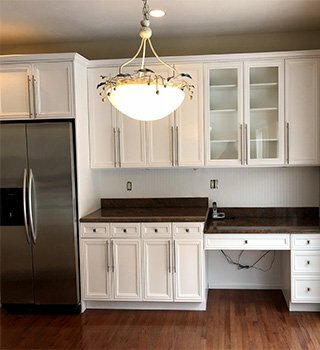 Since 2010, our professionals have refinished and remodeled over 1,000 kitchens throughout Long Island and Eastern Queens. 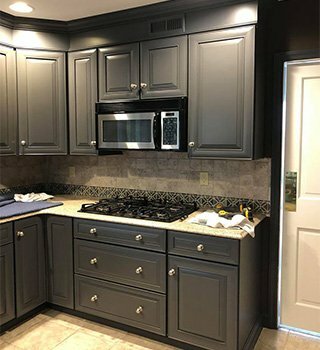 We partner with top-tier manufacturers to provide a design selection that includes hundreds of cabinet materials, stains, color options and kitchen countertop styles to meet any design preference. As area director, Jason was informative, honest and punctual. He explained the process in detail very patiently. 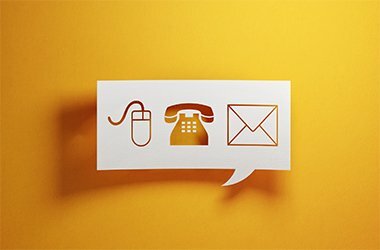 He called in advance to confirm appointments, There were no hidden fees. 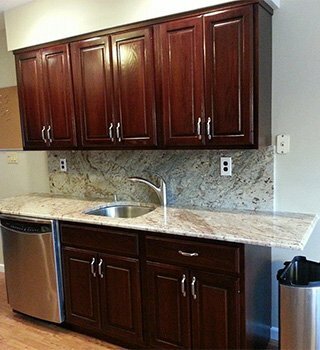 Joe and Jose were the craftsman who transformed our cabinets. 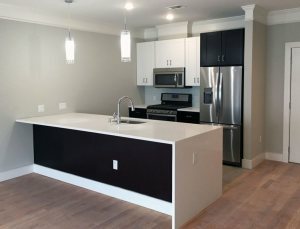 They did an outstanding job, paying close attention to detail and were very neat. They were also very punctual and would apprise us of their plan for the day. The finished product exceeded our expectations. This dynamic duo gets a US Navy "Well Done." 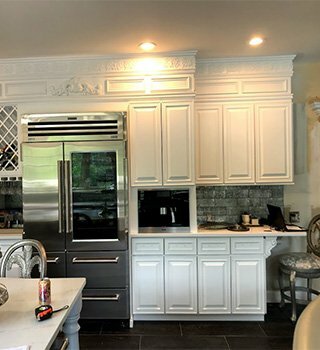 A note tosay thank you for the wonderful work done on my kitchen cabinets. They look brand new - I have gather so many complements from family & neighbors. Thank you again. Great job. Amazing job. 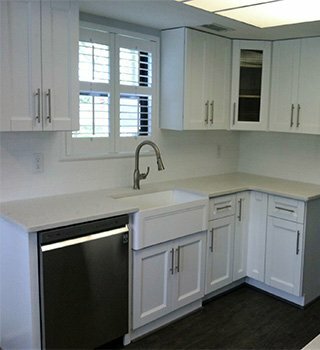 They gave me a new kitchen! Their work is truly transforming. 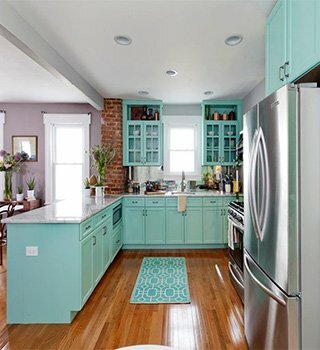 Just beautiful and very affordable. Jason and Joe are an absolute pleasure to work with. Their work is outstanding! My husband and I hired them for more projects around our house and we are so very happy with how everything is turning out. Great Work. Great Price. I highly recommend Jason Kong. 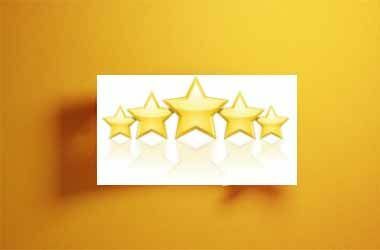 Mr. Kong is a true professional; extremely punctual, very polite and he provided rapid service. His workmanship is extraordinary. I was definitely pleased not only with the finished product, but also with the price. In my estimation, no one refinishes furniture better than Mr. Kong. Jason was very courteous and responsive to all my requests. His employee Joe was outstanding with his workmanship, attention to detail, and overall quality of work. 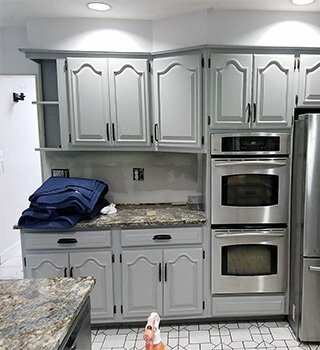 I have 22 year old, raised panel, maple cabinet doors and drawer heads which were transformed The bottom cabinet doors were beat up pretty bad, and required sanding to remove nicks and dings and fading. They came out great! Thanks again to Jason and Joe and the crew for doing such an excellent job. 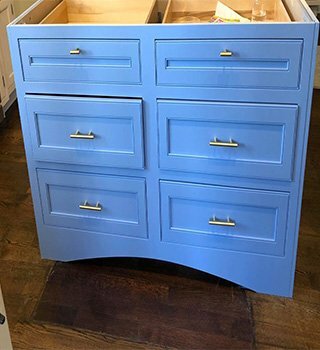 I recommend them to anyone who wants restore their kitchen cabinets. Jason at Long Island wood Renewal provided excellent service and craftsmanship. He stayed on schedule and on budget. 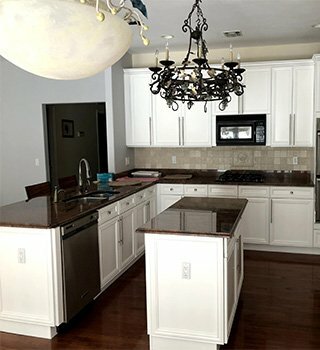 His fees for extra work requested were very fair and performed diligently in order to be completed with the entire project.We find him to be a completely trustworthy and honest businessman.His crew completely refinished all kitchen wall cabinets,base cabinets, pantry unit, butler pantry, wine rack, master bathroom vanity, to our clients specifications and color match.When a minor issue presented itself after completion, Jason immediately addressed and corrected the problem.I give Jason and Long Island Wood renewal an A+ rating and would not hesitate to recommend him for any project within his expertise.